In the midst of the chaos that accompanies the beginning of the school year, my mind has been absent from the kitchen, fixating on my new students and lesson plans instead. These early school days can be long and exhausting, as we all look for a new footing and gradually settle into a routine, developing the new rhythm of another year. Knowing of the movement on the horizon, on the final day of summer vacation I made it a point to spend a slow afternoon in my favorite location—the kitchen. Since plums have been especially sweet this year, I wanted to make the fruit the feature of my next pastry. With this tart, I consider the goal accomplished. The bright flavor of the plums stand out, complemented by a buttery crust and a sweet, rich almond filling. It was difficult to keep my fork away for longer than a few hours, as I pilfered bites between meals. While eating another rushed meal from a box for dinner this evening, my mind drifted back to the lethargic days of summer. The setting of the sun feels too early recently, the dark evenings making the summer months seem more than a couple weeks away. I sliced a plum for dessert, eating it while watching the sky turn orange. While I am excited for the weeks ahead, it is nice to take a moment and bring back the flavors of a simpler moment in time. 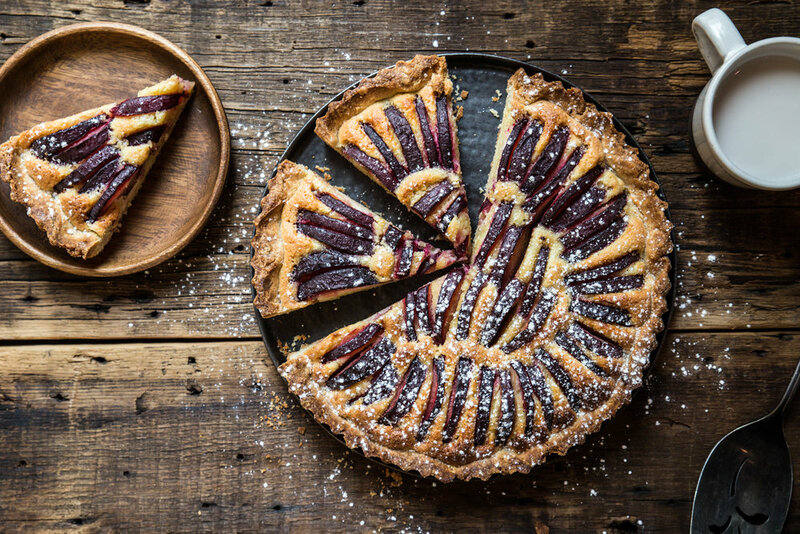 This Plum Almond Tart allows the sweet summer fruit to shine. It begins with a buttery tart crust filled with a rich almond filling. Then, sliced ripe plums are pressed into the top before baking. In the oven, the fruit roasts and the filling toasts. The tart can be served warm or chilled, depending on personal preference. I prefer the first slice warm from the oven and the second slice chilled as I steal a few bites the next morning for breakfast. In a large mixing bowl, whisk together the flour, sugar, and salt. Cube the butter and add it to the dry ingredients by rubbing it between your fingers until the dough resembles coarse sand. Add the lightly whisked egg and vanilla extract, folding the mixture until the dough comes together with a uniform appearance. Form dough into a disk, wrap in plastic wrap, and chill in the refrigerator for 30-60 minutes, or until cold. Preheat oven to 350 degrees F (180 degrees C). Line a 9-inch tart pan with parchment. On a lightly floured surface, roll out the dough into a 12-inch circle. Transfer into the tart pan and trim the edges. To blind bake, line the inside of the dough with parchment paper and fill with pie weights or dried beans to help the dough keep its shape while baking (alternatively, you can also poke the bottom of the pan with a fork several dozen times). Bake for 20-25 minutes, or until lightly browned. Remove from the oven and allow to cool. Remove weights and parchment, if necessary. Keep the oven temperature at 350 degrees F.
In a large mixing bowl, beat together the butter and sugar until light and fluffy. Beat in the eggs, vanilla extract, almond extract, and salt. Stir in the almond flour until uniform. Spread the filling evenly into the tart shell with an offset spatula. Place the plum slices upright in the filling and press down gently. Bake for 50-60 minutes, or until the almond filling is baked through and appears lightly browned. Cool to room temperature before slicing and serving. Snow fell from the sky in thick, heavy flakes as the sun slowly dipped below the horizon. I watched the world turn white from my couch, sipping a glass of wine while sifting through the mess of a craft project spread over the coffee table. I was ready for the change, ready to embrace the shift towards slow living that comes with the winter season. The cold weather feels like permission to stay indoors, wrapped in blankets and chunky sweaters, granting time to catch up on the quiet lifestyle that was put on the shelf when the snow melted in the spring. Winter is the season of recovery—an interval between life cycles—a pause for reflection and connection. The light changes in winter, reflecting and refracting off the snow and ice, infusing the world with cool tones and sharp lines. Winter flavors echo the qualities of the diffuse light, a continued expression of the season. While autumn flavors are an indulgence in comfort and warmth, winter flavors bring a sharpness, an edge that cuts through the complacency, a reminder that the season has changed. This Chocolate Gingerbread Tart feels like the bridge between the seasons, a transitional dessert. The smooth chocolate filling is sweetened and spiced with cinnamon, but the sharp bite of ginger cuts through it, bringing contrast to the dessert. Bake this dessert and share it with your loved ones over the holiday season, finding connection in each other's company. This Chocolate Gingersnap Tart is a decadent holiday dessert that is perfect for sharing. A gingersnap crust is filled with a rich chocolate filling and baked until the chocolate sets into a thick custard. The filling is silky and smooth, standing in stark contrast to the crisp, spiced crust. Use whichever type of chocolate you prefer—milk, semisweet, or dark—but take care to use a high quality brand. The tart itself is simple and quick to prepare; a small slice will go a long way. In a medium mixing bowl, mix together the gingersnap crumbs, cinnamon, and melted butter until evenly coated. Press mixture into a 9-inch tart pan. Bake for 8-10 minutes, or until fragrant. Remove from heat and keep oven on. In a medium saucepan, whisk together cream and milk. Warm over medium-low heat. Add in chocolate and stir until chocolate has melted and is smooth. Remove from heat and stir in brown sugar, cinnamon, and salt. Slowly add whisked eggs and stir until smooth. Pour chocolate filling into baked gingersnap crust. Bake an additional 15-20 minutes, or until chocolate filling is set and does not move when the pan is lightly shaken. Cool to room temperature before cutting and serving. Lightly dust with cocoa powder, if desired.